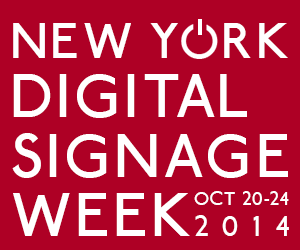 The Digital Signage Federation will host one of its networking Meet & Greet events Tuesday evening, October 21, 2014 in support of New York Digital Signage Week. The Meet & Greet event, sponsored by NEC, OpenEye and Peerless-AV, will be at the Croton Reservoir Tavern, 108 W 40th Street in Manhattan from 5:00-6:30-pm, and is free for DSF members - $15 for non-members - and includes an open bar and light appetizers. In addition to meeting to discuss ideas and presentations during New York Digital Signage week, which runs October 20-24, attendees will have the opportunity to network with Digital Signage Federation Board of Directors, in attendance to conversationally share their business experience, enumerate industry opportunity, and discuss the benefits of membership in the Digital Signage Federation. •October 20th – “If We Build it, Will They Come?” 4:00-6:30pm, a UK Screen Forum Event in association with Barco at Barco LiveDots’ lab facility.